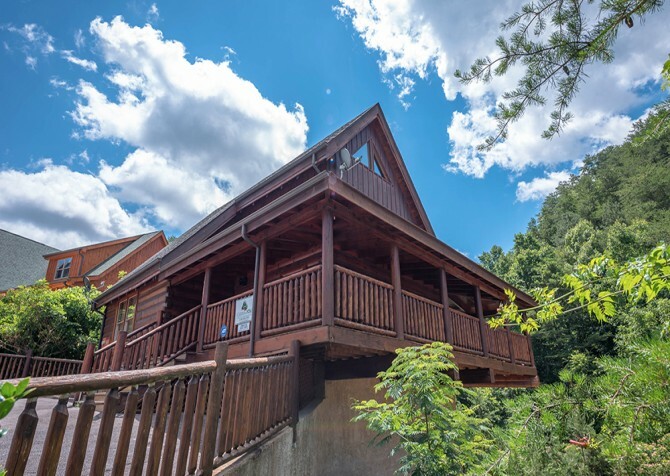 Located in the charming Bear Creek Crossing Resort, this 1-bedroom, 1 ½-bathroom cabin boasts the conveniences of home, a cozy cabin feel, community pool access, fun vacation amenities, and a short drive to some of the best attractions, restaurants, and shops in the area! Whether you’re looking for a romantic escape, a weekend with friends, or a fun family getaway, A Bear Creek Crib is a great space relax, play, and slip away for a bit. Spend days at A Bear Creek Crib enjoying meals around the dining table – made from scratch in your fully equipped kitchen, kicking back in the cozy leather sofas in front of the stone fireplace and TV, melting away stresses in the indoor sauna, shooting pool, and playing arcade games. And that’s just inside! Outside, relax with a good book and cold drink in the rocking chairs or the porch swing before climbing into the inviting hot tub to soothe tired muscles. 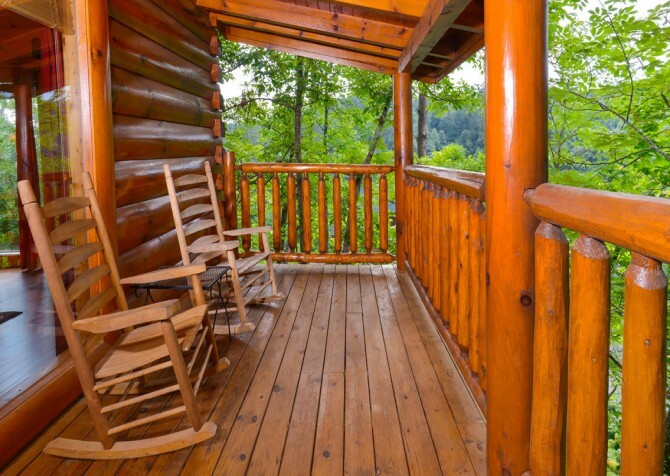 As you unwind, soak in peaceful wooded views and enjoy the serenity of staying in the Great Smoky Mountains. 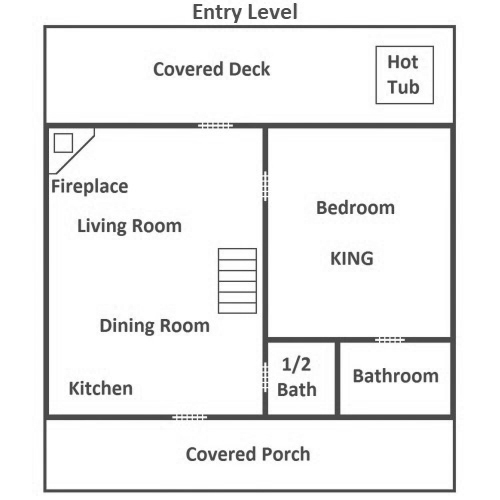 You’ll also have those conveniences you love at home, including a washer/dryer, a gas grill for cookouts on nice nights, big screen TVs, wireless internet, and satellite TV – with HBO! 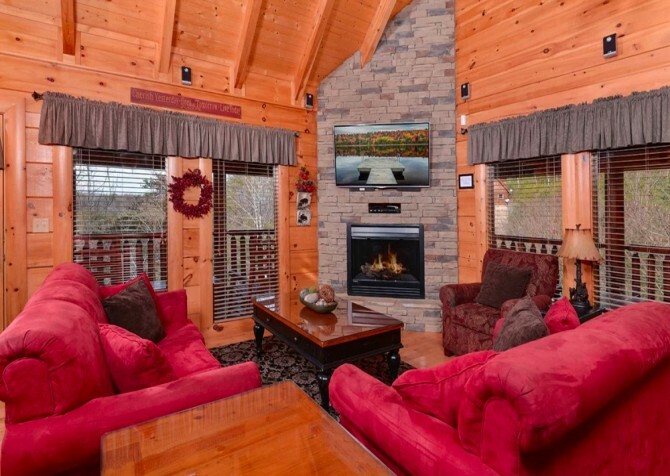 Great for entertaining and relaxing, the living room of A Bear Creek Crib features comfortable couches flanking a 48-inch flatscreen TV and beautiful stacked stone fireplace. 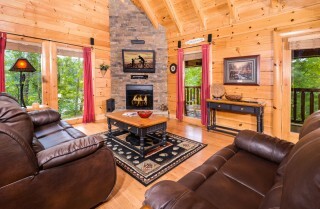 With local channels, satellite, HBO, and a surround sound system, you may not want to leave! 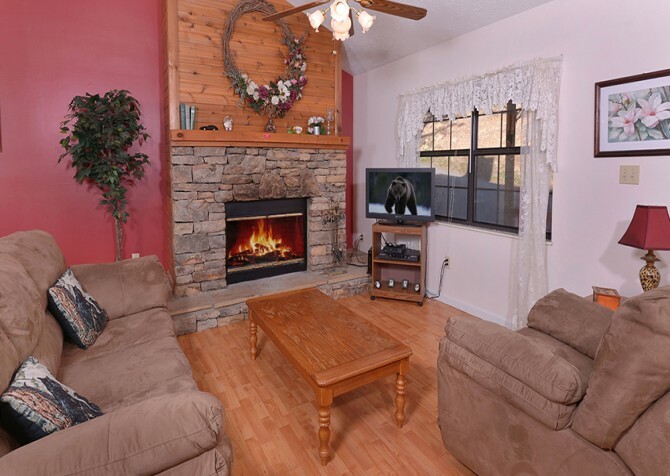 Curl up with a good book, watch the big game, or settle in for a movie marathon. Lamps by the couches make it easy to crack open that book you’ve been wanting to finish, and easy access to the kitchen means late-night snacks and game-day bites without missing a thing! Whether you want to save money on dining out, like having a place to reheat leftovers, or just enjoy doing your own cooking, the fully equipped kitchen in A Bear Creek Crib makes it all simple. Sleek black appliances pair with warm wood cabinets for a modern yet cozy feel. Keep the cabin stocked with everyone’s favorite drinks and snacks, or spend the holidays creating family favorites. 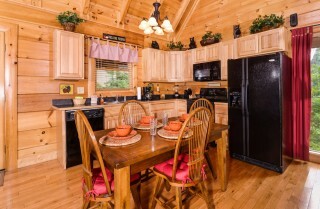 When the meal is ready, sit down at the 4-person table for some quality time. Have more guests? 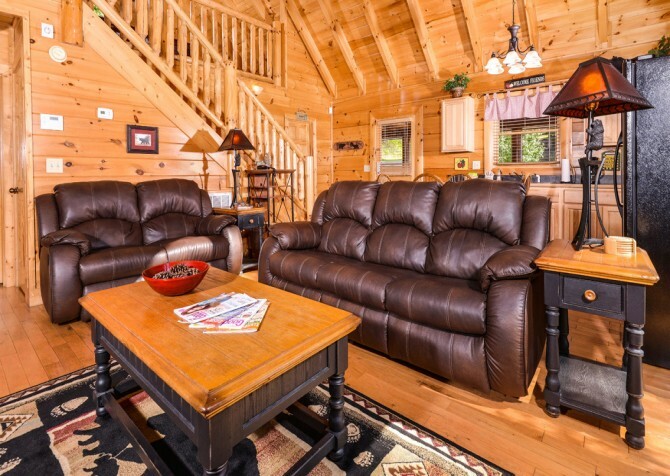 The living room nearby is great for spillover when you have a full cabin at mealtime. For more casual meals, set up a buffet of finger foods on the table or order pizza and just hang out and play around the cabin! When the day is done and you’re ready to unwind, pamper yourself in the awesome master suite of A Bear Creek Crib. 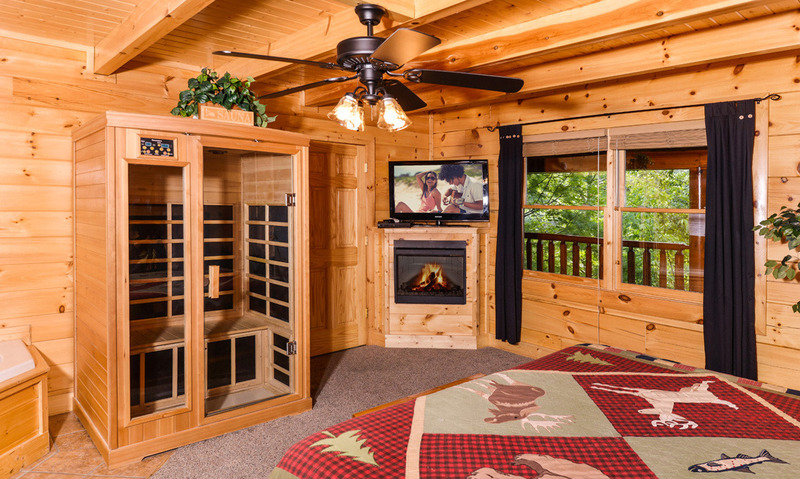 Before climbing into your comfortable king-size bed, spend some time relaxing in the infrared sauna – right at the end of your bed! This private space is perfect for soothing aching muscles after long hikes in the Great Smoky Mountains National Park or days spent exploring at The Island and in downtown Pigeon Forge. Then climb into the soothing jetted tub in the corner before showering off in your own bathroom and then flipping on the 37-inch flatscreen TV above your own fireplace! A ceiling fan keeps it cool on summer nights, and a large window lets in plenty of natural light. 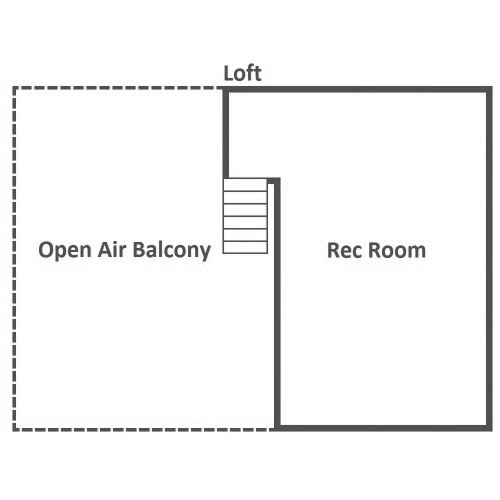 For more sleeping space, take advantage of the 2 queen sleeper sofas in the cabin (1 in the living room, 1 in the loft). 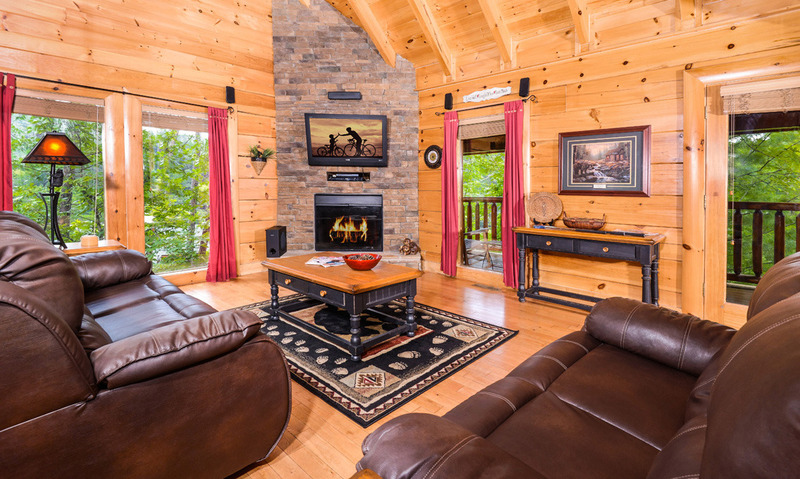 After hours exploring the Smokies, this cozy cabin will be a welcome retreat for everyone. 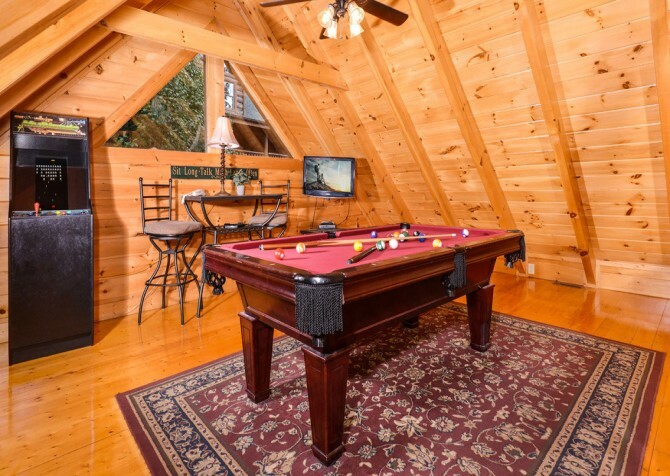 And the kids will especially love sleeping in the loft – right next to the games! Head up to the loft when you’re ready for playtime! Kids and adults will love this space, where there’s room to play, relax, snack, and hang out together. 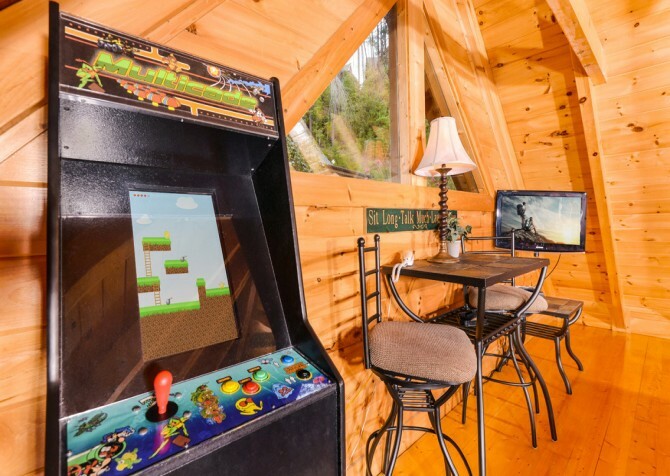 Spend your time here shooting some pool, playing arcade games on the multicade, relaxing on the sofa while watching TV on the 32-inch flatscreen, or enjoying a drink and snack at the high-top table for 2. 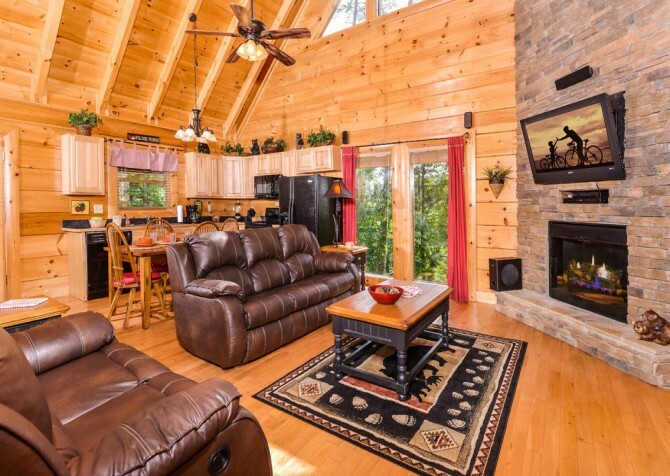 Flip on the fan when it gets warm and enjoy wooded views through the large windows here! 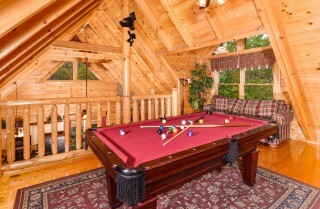 And of course, you can always check out what’s going on downstairs with a quick glance over the log railing. A vacation in the Great Smoky Mountains just isn’t complete without some time spent in the great outdoors. 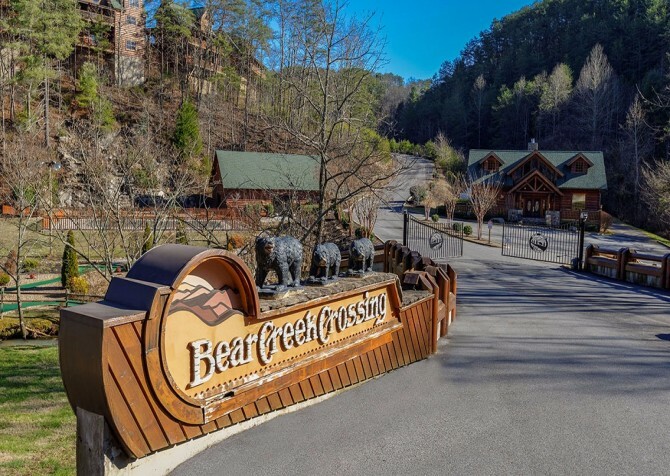 At A Bear Creek Crib, you’ll have easy access to the many great outdoor activities in the area – hiking, biking, horseback riding, swimming, picnicking, and more. And when you come back to the cabin, you’ll have some great deck spaces to soak in wooded views. Soothe your muscles with a soak in the hot tub at the end of the day, where a privacy screen and wooded views make you feel tucked away. On the deck, sit in the porch swing with a cold drink, a coffee, or a new book. 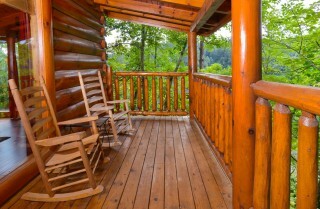 Or have the classic mountain afternoon: sitting back in the rocking chairs with a glass of ice-cold sweet tea. 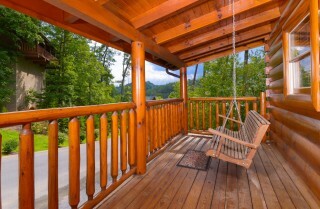 Whatever you do, the peace of the Smokies will surround you. Situated in the desirable Bear Creek Crossing Resort, A Bear Creek Crib is close to the fun of downtown. Check out Tanger Outlets, play The Escape Game or sip on moonshine at The Island in Pigeon Forge, go golfing, and enjoy great restaurants and family-friendly attractions in the area. Bear Creek Crossing Resort has more perks: indoor and outdoor community pools and a miniature golf course! 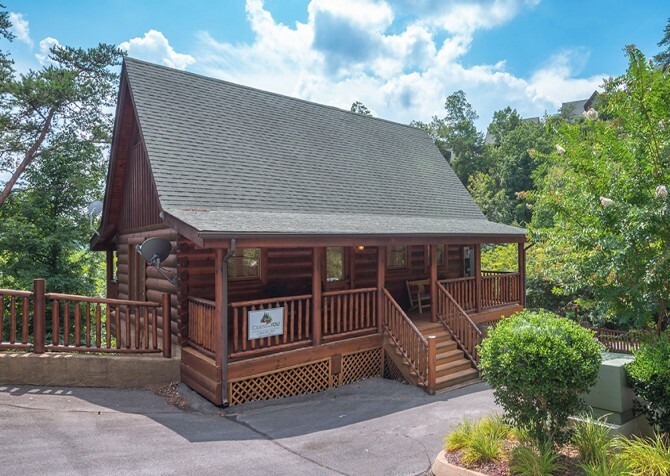 You won’t miss out on creature comforts here, with wireless internet so you can keep up with what’s going on and plan out your day’s adventures! A washer/dryer makes it easy to clean up hiking clothes (and pack light), and the gas grill will call your name on those lovely mountain nights when you’re craving kabobs, burgers, or steaks! When you want to get out for a bit, downtown Pigeon Forge isn’t too far away. 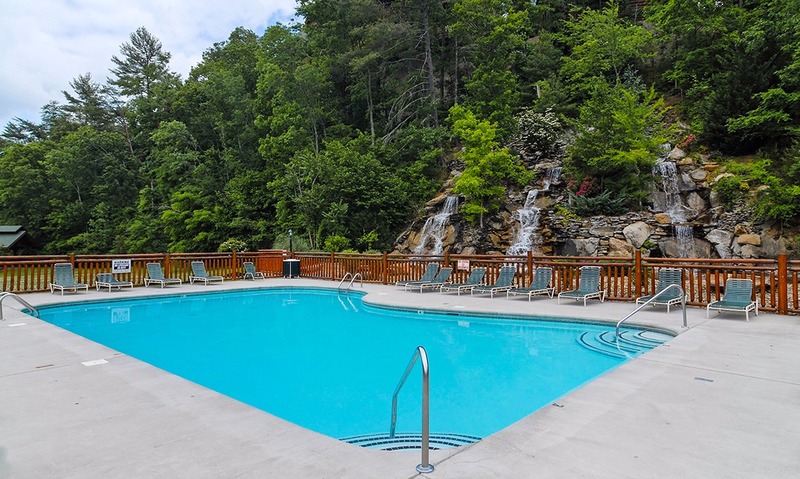 You can shop, dine, and play in this exciting mountain town or take a short drive to neighboring Gatlinburg for double the fun! Roller coasters, kids’ rides, water features, an eagle sanctuary, live musicals, decadent desserts, Southern comfort foods, carnival games and prizes…there is something for everyone at Dolly Parton’s theme park in Pigeon Forge! Grab a drink at Margaritaville, do some boutique shopping, try the ropes course, let the younger kids take a train ride, try to break out at The Escape Game, ride the Great Smoky Mountain Wheel, or sit back in the rocking chairs around the show fountain! It’s always a good day at The Island! Ready to stretch your legs and get some fresh air? Head to the most-visited national park in the nation – with FREE admission! You can hike, bike, go horseback riding, have a picnic, splash around in a swimming hole, or visit historic churches and homesteads. "We got to stay here thanks to the Cabins For You Flash Sale. We had a great time! The kids enjoyed the 9 hole mini-golf course, full size video game (in the cabin), and the pools (both indoor and outdoor). It was located in a very peaceful part of a gated community, and we felt very safe the whole stay. I would come back again and try to stay in the same place if it's not already booked! 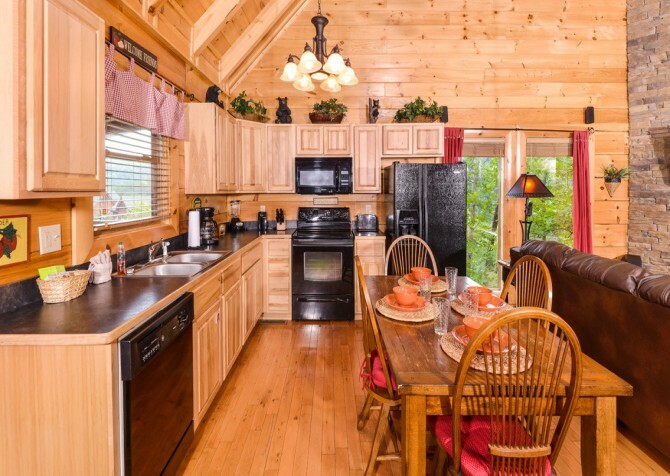 Thanks again to cabins for you for the great deal through the…"
"We got to stay here thanks to the Cabins For You Flash Sale. We had a great time! The kids enjoyed the 9 hole mini-golf course, full size video game (in the cabin), and the pools (both indoor and outdoor). It was located in a very peaceful part of a gated community, and we felt very safe the whole stay. I would come back again and try to stay in the same place if it's not already booked! 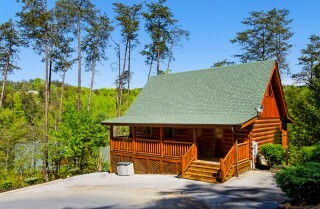 Thanks again to cabins for you for the great deal through the Facebook Flash Sale! See you again very soon." 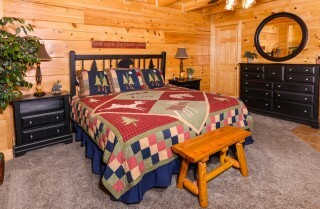 "Our family loved A Bear Creek Crib. With two sleeper sofas there was plenty of sleeping area for our family of four. Our kids loved the loft with pool table, arcade game, and DirecTV. 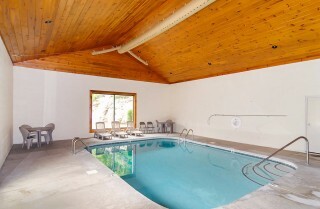 The two swimming pools, indoor and outdoor, and miniature golf were big hits too. 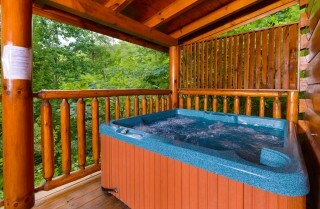 We spent our evenings soaking in the hot tub on the private back deck. 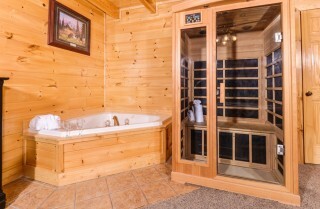 My wife loved the sauna in the bedroom and jetted tub to soak in afterwards. 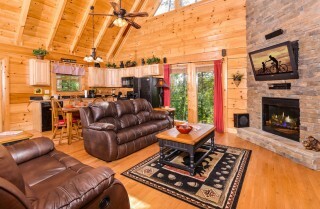 The cabin was perfect for us!"